Digital signage can be found everywhere from public spaces like retail stores, transportation systems, stadiums, hotels, restaurants, corporate buildings, and more. Because of the ability to frequently and easily update content – many commercial businesses and institutions are looking at deploying it in their organization as a way to better improve efficiencies around communications. At The Little Guys, we’ll help make sense of it all for you from the best content management systems to use as well as the best ways to distribute it conveniently and seamlessly to meet your business goals. Displays – Selecting the proper display for your specific application is the key to years of high performance results. 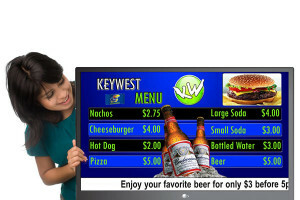 We’ve all seen the blurry or all yellowish displays in a bar, restaurant, or reception area. When done correctly, this will never be an issue. Using the latest technology from premium companies, like Planar, allows us to stay ahead of the curve. Content – You can take whatever content you choose and display it in a variety of ways to increase the impact of your message. Hardware – The right bracket, power supplies, image controlling software, and proper surge protection make for a first class presentation. Whether you wish to keep your employees up to date on the latest information, show your clients your latest presentation, or just meet in a comfortable space with your employees, setting up a training room with great video and sound presents a lot of challenges. We can make sure all of these things are addressed in your solution. You need the lights on for people to participate and do work at their stations, so you need the right projector and screen combination that allows for clear viewing in a bright space. Dialog articulation is critical and the sound needs to be evenly distributed throughout the space. 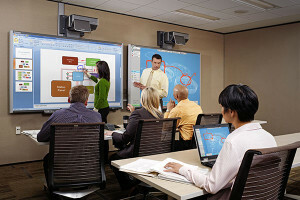 With many people doing presentations, a simple and reliable interface for control is paramount. The experience of using technology should be a pleasure, not a headache, so things run smoothly and on-time.